Absolute joy. 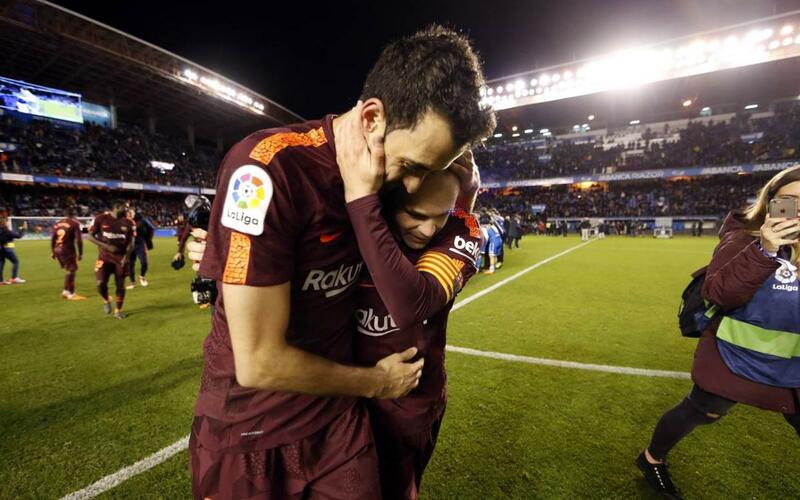 These were the scenes after the final whistle blew at Riazor and Barça were confirmed league champions for the seventh time in ten years, and the twenty-fifth time in total. The players immediately gathered in the centre of the pitch to form a group and sing and dance in a shared outburst of emotion. For some, like Messi, Iniesta, Piqué and Ter Stegen, this was something that’s become kin to second nature in recent years. But for the likes of Dembélé, Coutinho and Semedo it was something entirely new. But if the on-pitch celebrations seemed a little more restrained than they usually are on these occasions, it was for a very honourable reason. All around the stadium, there were tears not of joy but of despair. The 4-2 defeat has confirmed that Deportivo will be dropping back into the second division. So, out of respect for them, the Barça players soon moved their party indoors… and from there, long into the night. On Monday, they’ll be celebrating not just this conquest, but the Copa del Rey as well, on the streets of Barcelona. Hope to see you there!